WEST KELOWNA, BC –The Penticton Vees don’t waste time getting to work on the road. The Vees scored three goals in just 44-seconds in the first period, as they doubled up the West Kelowna Warriors 6-3 Friday, at Royal LePage Place. 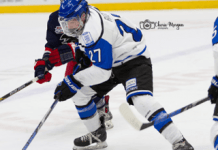 Ryley Risling, Kenny Johnson and Captain Nicholas Jones scored in under a minute midway through the first period, as the Vees got off to another hot start. Jones scored again in the second, short-handed, and Ben Brar and Ty Amonte added singles in the third. Mat Robson turned aside 23 of the Warriors’ 26 shots for his tenth win of the season. After being blanked by Nanaimo one week ago, the Vees scored 10 goals in their two wins over Merritt and West Kelowna this weekend. Connor Sodergren scored twice for West Kelowna and Quin Foreman added another, as the Warriors lost their sixth straight game. The Warriors sit sixth in the Interior, now three points behind the fifth place Salmon Arm Silverbacks. Penticton’s offensive barrage in the first started just past the halfway mark. Just after a Vees’ power-play expired, Risling fired home a pass from behind the net from the slot at 10:17. 12-seconds later, the Vees found the back of the net after a clever tic-tac-toe play. Defenceman Kenny Johnson finished off the pretty passing play for his second in as many games at 10:29. The flurry didn’t end there, as they orchestrated another pretty passing play, this time with Jones tapping it into an open net at 11:01; his first of two on the night. West Kelowna got on the scoresheet late in frame, after a turnover just outside of the Vees zone. Foreman walked in on the left-wing and snapped it over Robson’s glove at 18:41, to give the home team some life. Penticton got their three-goal lead back midway through the middle stanza and shorthanded no less. Jones stole the puck at his blue-line and rushed it back the other way on a two-on-one. The Captain kept the puck and picked the corner over the goalie’s blocker at 9:08. The home team pushed back in the latter half of the second, as Sodergren scored twice in just over a five-minute span. 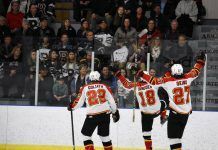 First, he tipped-in a pass at the side of the net at 14:42 to make it 4-2, and then he fired from the slot, through a screen, at 19:02 to make it a 4-3 game late in the second period. West Kelowna almost came all the way back early in the third period but Robson came up with two excellent saves in the opening moments to preserve the one-goal lead. First, he robbed Foreman with a point-blank toe-save and then followed that up with an excellent shoulder save on the rebound attempt by Reed Gunville. That saved loomed large, as the Vees pulled away with two more goals minutes later. Ben Brar padded the lead at 2:10 when he redirected Griffin Mendel’s waist-high point-shot from the slot; Brar’s second in the last 24-hours. Then Ty Amonte made it a 6-3 game when he scored blocker-side on another odd-man rush at 6:23. In their last two games, the Vees have now outscored their opponents 7-2 in the first period. With the win, the Vees (13-2-0-0) increased their lead to seven points atop of the Interior Division over the idle Merritt Centennials. They also bump up their road record to 9-1-0-0 and their record against the Division now sits at a perfect 6-0-0-0. 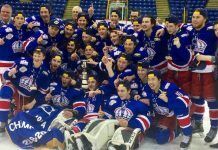 The Vees are back on the ice Wednesday, October 26th, when they face the Surrey Eagles at the SOEC. It’s another “Wicked Wednesday,” presented by BCAA and it’s also “Vees Fight Cancer” night. The Vees will be wearing special pink jerseys for the game and fans can make a donation to the Canadian Cancer Society at the game.